520 East 11th Street, Manhattan, in the 1970s. 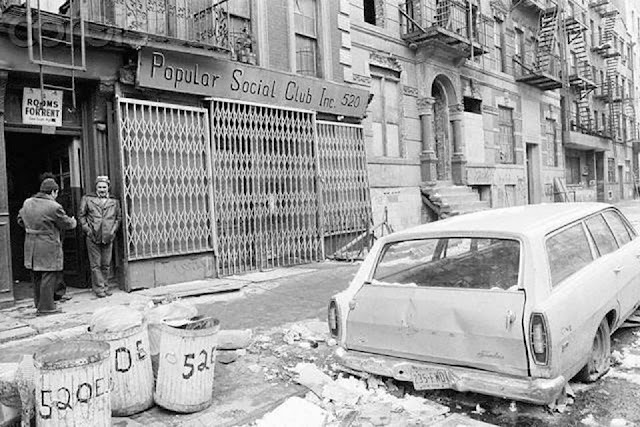 I found this quaint picture of East 11th Street, New York City, in the 1970s and decided to research it. I was dying to find out what this location looks like today. So, I did a comparison of the exact spot of this picture with a view of the same area taken from Google Street View. The result is below. As you can see, 520 East 11th Street was a "Popular Social Club, Inc." in the 1970s. One can only speculate as to what social things the club members participated in. Notice that the "classic car" out front has at least one flat tire and that the trash is artfully arranged in open trash cans. Comparing the before and after shots is like a class on gentrification. Notice how the open stairs to the right of 520 have been enclosed in that fancy way of folks living west of 5th Avenue (in fact, all row house originally were built with open stairs like that 100+ years ago, it just took some neighborhoods longer than others to buy install ones). Also notice what a dramatic difference a little greenery does to a bombed-out landscape - it's positively transformative! The Social Club has been divided into two separate businesses, a dry cleaner and a nail salon, no doubt in combination paying much more rent than the previous tenant. Everything now is nicely painted, everything is detailed to perfection, and there aren't any winos standing out front. The fire escapes are now "quaint" as opposed to being the dangerous eyesores that they were back in the 1970s. The East Village really has undergone a Renaissance in recent decades. It developed a very poor reputation in the 1970s and 1980s, but has been on the comeback trail for the past 30 years. 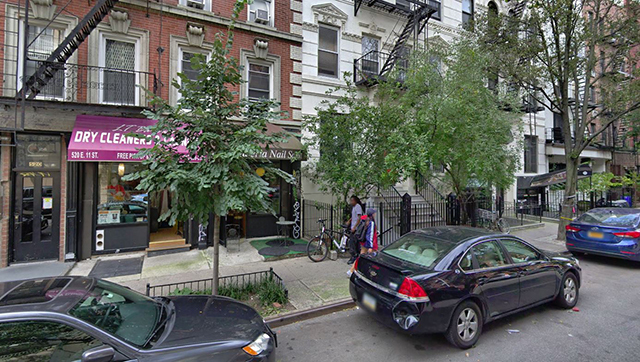 It has one key advantage over Brooklyn Heights or Park Slope: it is in Manhattan. There is something very valuable about being on the right side of the East River, and don't let any Brooklyn hipsters try to tell you otherwise. Oh, and if you think the landscape-from-Hell in the 1970s picture was some kind of aberration and that I am just picking on one isolated spot - don't. The entire East Village was like that back in the day. In fact, it was rough through the 1990s, though not quite this bad. However, money talks. Sooner or later, if the location is valuable enough, the money will find it. Note, though, that the past hasn't completely left the East Village - if you look very closely at the door frames of 520 East 11th, you will notice some graffiti. Urban art or not, some things never change. Thank you for visiting my series on "the more things change, the more they stay the same." East 11th Street, New York, ca. 2018, via Google Street View.